The oldest covered bridge in Europe, Chapel Bridge (Kapellbrucke) has spanned the river Reuss in Lucerne since the Middle Ages. Decorated with paintings along the interior, it is one of the most popular tourist attractions in Switzerland. Measuring 670 feet (204 meters), Chapel Bridge was first constructed around 1367 as part of Lucerne’s fortified city walls. At one end sits an octagonal stone tower used at times as a dungeon and a treasury vault, and at the other, St. Peter’s Chapel, for which the bridge is named. As one of the city’s most famous landmarks, it’s a stopping point on many guided tours of Lucerne. A fire in 1993 severely damaged the bridge, and many of the more than 100 17th-century painted panels were destroyed—25 were saved. Since then, the bridge has been fully restored and paintings that were in storage were brought out to replace those damaged. Some burned panels remain as a reminder of the fire. Entry to the bridge is free. The bridge marks the point where Lake Lucerne flows into the Reuss river. The octagonal tower is not open to the public. Chapel Bridge is the oldest surviving truss bridge in the world. 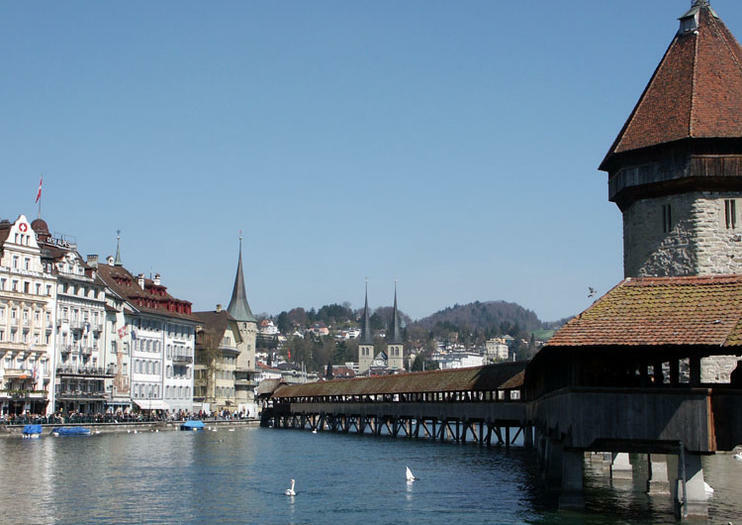 Chapel Bridge is located in the center of Lucerne on the Reuss river. The city’s main railway station is a short walk away, and the bridge is accessible on foot and as part of a walking tour of the city. A public thoroughfare, the bridge is open 24 hours a day year-round. The bridge is popular with tourists and can get very busy in the summer months. Carved into a rock face above a small pond in Lucerne city center, the Lion Monument is a memorial and must-visit for many tourists coming to Lucerne. Created in the 1820s, the statue of a dying lion is dedicated to members of the Swiss Guard at the French royal court who were murdered during the French Revolution.